As we forge into a new year, 2016, we can start things off with a clean slate. It's a great time to evaluate habits we may want to leave behind and new ones we may want to start. Health is often one of the top-rated categories within this self-evaluation. Learn more about why you may want to eat more nuts in 2016. There are many different myths and theories about whether nuts are good for you or not. As with anything else, the key is moderation. Even too much of a good thing can make it a "bad" thing. With nuts and seeds, the main thing to remember is portion control. In controlled quantities, nuts and seeds can be extremely beneficial to maximizing our health and well being. If you don't already have a healthy habit of adding controlled amounts of Eatnuts.com Nuts and Eatnuts.com Seeds into your diet, the new year is the perfect time to integrate nuts into your daily regime. Here are some of these reasons reasons why you may want to eat more nuts and seeds in 2016. Nuts are full of healthy fats, fiber, and protein, so in moderation, they have been proven to help those trying to lose or manage their weight or seeking long term weight loss. Adventist Healthy Study examined obesity and metabolic syndrome in over 800 individuals. They uncovered a strong inverse relationship between tree nut consumption and developing these medical conditions, meaning those who ate more nuts were less likely to be diagnosed with these conditions. Other studies have also shown that the additional calories consumed when eating nuts tend to get offset due to the large amounts of fiber and nutrition. Moreover, the high levels of protein and healthy fats help keep you satiated longer in the day, curbing further cravings. There have been numerous studies linking lower risk of heart disease and heart attacks with regular nut consumption. The evidence is so compelling that the Food and Drug Administration started allowing the claim that an ounce of nuts a day can reduce the risk of heart disease. The primary trigger for these benefits is in the unsaturated fats. These fats support regulation of cholesterol and triglycerides. Walnuts, in particular, are loaded with the short chain omega two fats which help support the heart's rhythm, making them your number one heart choice. However, you may want to create a nut mix and consume a tablespoon a day for optimal benefits. In 2014, St. Michael's in Toronto did a study showing that two ounces of nuts a day improve the daily glycemic control and HbA1c values in type 2 diabetics with no weight gain resulting from the additional consumption of the nuts. 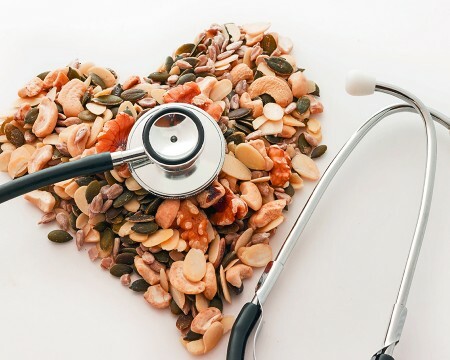 By adding a moderate amount of nuts into your daily diet, you can not only manage the risks of developing diabetes, but you can help manage and control a pre-existing condition. In 2014, there was a study done at Pennsylvania State University with 30 people who had type 2 diabetes. The participants were assigned a "moderate fat" intake, sourcing 20% of calories from pistachios and followed by a low-fat diet. In about four weeks when blood pressure and heart rate variability were checked, they noted a significant improvement. Being able to lower or manage blood pressure levels can also mediate risks associated with heart disease in a positive way. You may have not realized that you could support your healthy in so many ways simply by eating nuts. Now that you want to incorporate more nuts into your diet for 2016, you may be asking yourself how. Make sure to read our blog on "Simple Ways to Add More Nuts into your diet in 2016" or keep it simple and just snack on a handful or two of nuts a day. Eat a variety of to obtain all the health benefits of nuts.